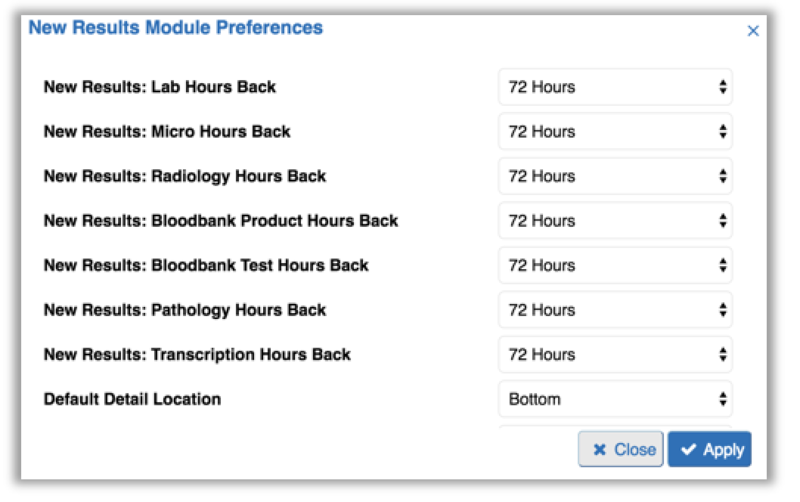 In ClinicalConnect, users have the ability to enable the New Result flags to appear in the Blood Bank, Cardiology, Lab, Micro, Radiology, Pathology and Transcriptions modules. If enabled, these New Result flags will also appear as visual indicators in the census lists, alerting the user that new results exist for the patient’s selected encounter. The Cardiology module is included in the New Results flags. The New Results module aggregates the results and displays them all in one list for the selected patient encounter. Each of these new results can also be viewed in the associated clinical module. Results are determined to be “new” based on your individual Preference settings and are flagged as “new” up to a maximum of 72 hrs back from your current log in and for those results that you have not already viewed within your set parameters. These flags are encounter-specific and will reflect “New Results” contributed from the source hospital system. The New Results indicator is not available in the Labs Component list and Labs Trended list views. New Results flags will appear in the census lists (if enabled). From the Census list, you can hover over the New Results indicators to see a tool tip that shows the name of the module and the number of new results that are in the patient’s record for that encounter. New results are identified with colour coded visual indicators that display in various census lists, within the patient’s record in the Clinical Modules menu, and in the New Results module list view. These flags serve as quick alerts showing that new results exist for the selected patient encounter. The indicators also have a number in each coloured indicator which tells you how many new results are available in each module. To access the New Results module, click the New Results option from the Clinical Modules menu. Clicking a result from the list will display the result details. Once a result is viewed, the new results flag is removed and is no longer considered a new result. The result will then no longer appear in the New Results module but can be accessed from the associated module. You can customize which modules you would like flagged for new results and the amount of Hours Back for each module to display New Results. For new users the New Results module will be automatically set to default to 72 hours back for all available modules. The results are considered new based on your New Results module preference settings. 1. Click the Preferences button in the New Results header. 2. From the New Results Module Preferences window, select how many hours you want to go back for a result to be flagged as new. You can go back 24, 48, and 72 hours from the current date. If you select Disabled in a dropdown, the corresponding module will never flag a result as new. If you find that you’re not seeing new result flags for the patient’s record, make sure the Hours Back is not set to Disabled. You also have the option of customizing how the New Results display in the module by defining the Sort By and the Sort Direction. 3. Click the Apply button once you have selected the number of hours back for flagging new results.